WTF ! 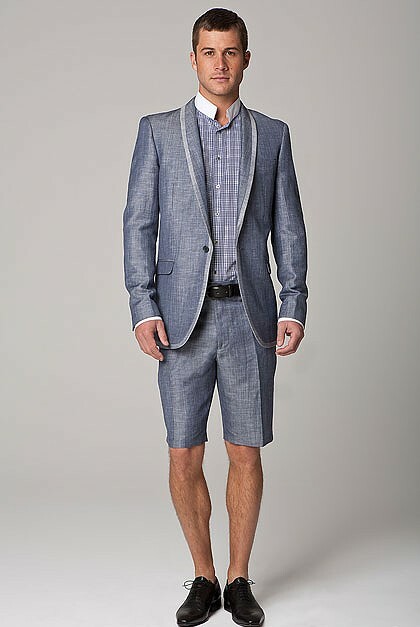 Short suits ? Struth mate. How to look like a complete nonce in one easy lesson. As an ex money-market trader and man about town who used to wear $1000 Hugo Boss suits and still likes to dress up in a tailored one for special events ( like the one I am wearing today for lunch with the new Australian Ambassador at her residence ) , I was horrified…nay….sickened to see this little snippet in the SMH this morning . Yeah…stand out like a Florist at a Loggers conference. Yes…I DO know. NO guy in his right mind would wear one of these nonce suits unless he was a card carrying chutney ferret. Well that rules me out then THANK GOD. I have men’s legs; Hair, scars and dry spots. 2 Responses to WTF ! Short suits ? Struth mate.